Room for One More Indiana Jones Review? In an attempt to explain its flaws, the new Indiana Jones film has been described as a popcorn movie. But I’d like us to just hang on a minute. I really don’t like this. Why has this suddenly become a derogatory term? Point A is that, when he really tries hard, Steven Spielberg is a cinematic genius. Go away and watch, or watch again, Jaws and Close Encounters and we’ll discuss. Point B is that Jurassic Park is probably the ultimate popcorn movie. It’s also terrific. It’s as good as Jaws and far better than many of Spielberg’s more worthy films like Schindler’s List. The first three Indiana Jones movies, to a lesser extent in that they are full of terrific bits rather than being terrific films, are pretty good popcorn movies. So I’m afraid that when I hear popcorn movie I am expecting something outstanding. Or at least pretty good. 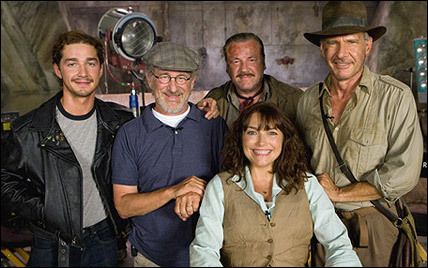 Indiana Jones and the Kingdom of the Crystal Skull has many reasons to be a great movie. Spielberg, or course. It’s also got John Hurt and Ray Winstone it in. And for a movie star, I don’t think Harrison Ford is a bad actor. On the less positive side is the involvement of George Lucas. I’m really sorry, but Mr Lucas should never be allowed near films. Steven, didn’t you notice what a balls up he made with the Star Wars sequels? (okay, I know they were prequels, but I like to deliberately annoy Star Wars fans). And anyway, unless you are aged five the original Star Wars is a really bad film. So the partnership with George Lucas always made the Indy films my least favourite of Spielberg’s popcorn stuff. From what I’ve read and heard, Harrison Ford’s age at 65 has received much comment. It’s amusing because, when Raiders of the Lost Ark first came out, I remember saying to my friends “did you know that Harrison Ford is about forty?” So he has always been old in my eyes. The film begins by telling the audience loudly that we’ve reached the 1950s and Jones is almost two decades older. In fact Spielberg decides to shout this from the rooftops. An Elvis soundtrack, period cars and costumes, secret army nuclear testing sites – and all before the titles have finished rolling. Indiana Jones is now under the spectre of McCarthyism, not only fighting off Russian baddies but himself suspected of Communist leanings. The opening scene of the film is very impressive and Spielberg and Lucas cleverly won me over with little effort. Cate Blanchett as a heavily accented villainess, Ray Winstone in top form as a greedy turncoat and some excellent magnetic tomfoolery involving Roswell alien artefacts. It never really slows down from there. More reminders of the fifties before Spielberg bores of the attention to detail, including an homage to Brando in The Wild One, lead us swiftly into more familiar Jones territory. Cobwebbed caverns, skeletal remains, treasure, stone passageways and the rest. It’s really another collection of terrific bits, but they are all superb. Very hungry ants, an exhausting car chase, disappearing spiral staircases … but it’s purely a visual feast and beyond description. Performance-wise it’s good too. As mentioned, the excellent Winstone, and John Hurt delivers the really barmy role that’s been missing from his career. Ford carries it off rather well, and the family business that’s introduced is much less of a drag than I would have thought. Jim Broadbent’s there too, as a doddery academic, and, despite some of the criticisms she’s had, I found Blanchett a fine nasty. What’s slightly out of place is all the alien and atomic stuff, although it’s interesting to see Spielberg’s attempts to blend Indy with ET and Close Encounters. And my favourite scene was probably the weirdest, where Jones runs across a fake 50s sleepy town, complete with family mannequins who are populating an eerie bomb test site. If you’ve already seen the film, you’ll agree that they really made those old American fridges to last. So Lucas you’re forgiven, at least for the moment. And Spielberg – as for you, good marks but you’re coasting. And you know it. Is it a good popcorn movie? Yes it is, although we had a big box of sticky sweets shared between yours truly and two nine year olds. And it’s more like that; sticky, sugary with various yet familiar flavours and it will spoil your appetite for more of this kind of stuff for a while. But it was good while it lasted. I saw this while on holiday in the states and although I was rather suspicious I really enjoyed it. For some reason the alien thing seemed like a mis-match but on second thought it shouldn’t be that weird, Indiana Jones has always entertained some element of the supernatural hasn’t it? Lovely review. We avoided the popcorn and enjoyed some ice cream instead. Yes I guess they do, thinking back to Raiders.